My new translation will be available in amazon and barnes and noble within 2 days. Marcus Fabius Quintilianus was a Roman rhetorician born in Spain, with a huge influence and followers that lasted through the middle ages, the Renaissance, and as late as Jane Austen times, in England. In the English speaking world his influence can be traced through Erasmus, Thomas, More, Lord Bacon, Adam Smith, and Hugh Blair. Blair’s textbook drew enormously on Quintilian, and it was mandatory part of the curriculum of the times; allusions to which may be found in Jane Austen’s novels, but particularly in Pride and Prejudice. Quintilian’s works touched different fields of study: philosophy, history, rhetoric, jurisprudence, literary criticism, and literature. In the United States, many educators followed Quintilian’s methods of teaching and writing. In fact, John Quincy Adams’ lectures at Harvard University became the initial point for the teaching of Rhetoric in many universities. Books 1 and 2, deal with early childhood education. Trivial as it may seem today, Quintilian thought it important to discuss topics such as what should the parents do: educate the child at home or send him to school; discerning talent and temperament; the teaching of grammar (detecting barbarisms and solecisms); reading of the classics; discipline; nature versus nurture; is rhetoric and art—does it have any moral value? Is it useful? Etc. Educators, teachers of all levels, historians, writers, students of the law, speakers, public speakers, politicians, administrators, managers, and business executives, will find these discussions enlightening. 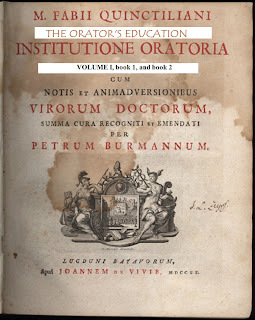 A well-rounded education should include the reading of all the books in Quintilian’s Institutio Oratoria. Comments on "Quintilian's The Orator's Education (Institutio Oratoria)"